A few weeks before I adopted Hayley six years ago, she faced a veterinarian who was preparing to euthanize her and said, "Not yet." Not long thereafter, she arrived at a beautiful farm in Harvard on a crisp October day in 2006, and immediately acted like she owned the place. For five blissful years, she romped through green pastures with her best buddy, Bey: the two old horses seemed much younger than their years, relishing one another's company and thriving in a drafty old barn that offered all the fresh air they needed. Hayley galloped and squealed and even jumped into the air. 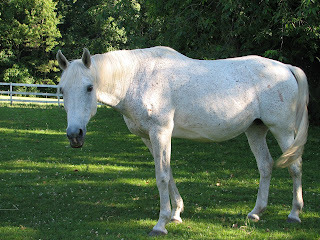 She didn't look anything like the broken horse I'd first met at Bay State Equine Rescue (BSER), and it was a joy to see her loving her life, maybe for the first time. Before BSER's Susan Sheridan saved her from the clutches of kill buyers at an auction, Hayley had been hard used, in service as a Premarin mare. She didn't have a name then, but was known only by her brand, #188. It was probably her many years of inhumane confinement that decimated Hayley's lungs, and caused her breathing to be compromised for the rest of her days. She suffered another blow last November, when laminitis claimed Bey. I felt the depth of Hayley's sadness when I found her at dusk one rainy evening, a few days after Bey died, standing alone in the middle of the paddock where he lay, her head down as low as it could go, as if nothing mattered anymore. Though we never found another companion for Hayley, she seemed to adjust to spending her days alone, but a certain joie de vivre seemed to have left her when Bey did. Then came the torrid summer and its relentless humidity, and so did the onslaught of Hayley's breathing problems. I had hoped that cool mornings would bring some welcome relief, but this year, the early fall breezes seemed powerless to loosen the grip of the long years of damage. Hayley was failing, but she had always bounced back before, so I continued to hope. Until yesterday morning, that is, when for the first time in six years, she lay down outside her stall as if she couldn't muster the strength to stay on her feet. She seemed to respond to the vet's ministrations, and when I left her, after several hours, she was drinking and taking tentative bites of hay. She'll be fine, I told myself. She had to be. 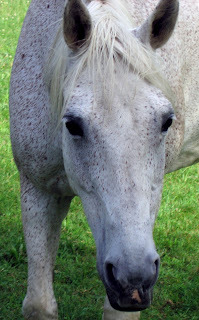 Hayley was a mare who taught me how to trust, and how it felt to be trusted. Who taught me how to love, expecting nothing in return, but getting so much more than I can ever measure. Our quiet times together were a source of solace in times of stress. She was always there, nickering a happy hello. But last night, that voice was silenced forever, though it echoes still in my heart. Hayley went into serious respiratory distress, and by nightfall, she was in the throes of a colic that wouldn't quit, in spite of everything we did to quell it. This time, there was no reprieve. No choice but to say a gentle good-bye. A little part of me died, too, when she took her last breath. My heart breaks for you. It's never easy to have to say goodbye to anyone we love and I shake my head when people say, "it's only an animal" and I truly feel sorry for them that they don't have it in them to feel what we feel for another life. And it's NEVER "only an animal." It is with great sadness that I read this. It brought tears to my eyes. It is a wonderful tribute to Hayley. Thank you for adopting and taking such good care of her. Despite your grief, Maureen, you have written eloquently about your sweet Hayley--and what a very lucky girl she was that you came into her life to save it and give her the love she'd never known before. My heart goes out to you. Dear Maureen, I'm so very sorry for your loss. You gave Hayley the best years of her life, I know that to be true. Your written tribute is both mournful and beautiful, just as life is. Live, love, love again.